You can find some of the most luxurious homes in the Metro DC area in Montgomery County. The median price of a home here is around $400,000. Homes valued at $900,000 and higher represent the 10% most expensive. The top 5% are valued at $1.2M or more, and $2M+ for the most expensive 1%. 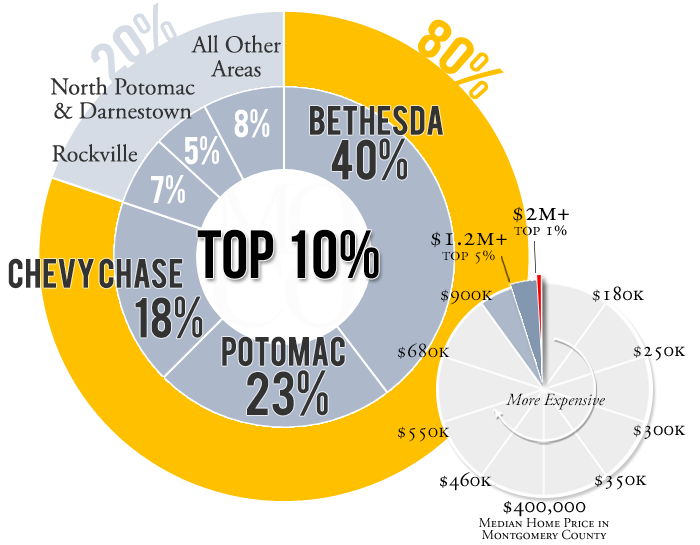 You can find luxury homes throughout Montgomery County, but most in the top 10% price bracket are clustered around the capital beltway and the Potomac River in Bethesda, Chevy Chase and Potomac.